Hello LDV readers! It's Rebecca and Paula from Sea Island Drive! We're thrilled to be sharing our first Two Styles. One Room. post with you and are honored to be part of the LDV team. Both working interior designers, we feel the best spaces are created when two (or more) styles merge...classic meets edgy, masculine meets feminine, rustic meets refined. When styles collide in just the right way, it creates a space that is rich and complex. So, today we're featuring a space that fearlessly mixes stunning classic details with edgy, modern furnishings. A space we are both smitten with! This gorgeous living room is obviously rich in traditional character. The fireplace surround, the ornate plaster ceiling medallion, the crown molding and base boards with a traditional cap--all of these reference a style much different than the modern, clean lines of the chandelier and furnishings. But, they work so artfully together that not only do we desperately want to sit in those chairs and chat over a couple of glasses of champagne, but we are dying to see the rest of this incredible residence. So, why do they work together? Well, there are a couple of things to take note of. First, the homeowner (and designer, most likely) committed whole heartedly to the mix of styles. They honored both the architecture and the collection of modern art, lighting, and furniture by letting the architecture shine and keeping the furniture sleek in contrast. Second, they kept the color palette relatively quiet. Knowing that the architecture and the furnishings were both going to make such big statements, and such different statements, it was wise to not throw bold colors and patterns into the mix. We think this is a perfectly executed room where classic meets edgy. It's sophisticated, elegant, and rich. Most importantly, it makes you want to stay and see more! Are you inspired to create your own custom mix of styles in your home? Tell us, what combination of styles best describes you and your dream home? Shop our picks for Classic and Edgy below. 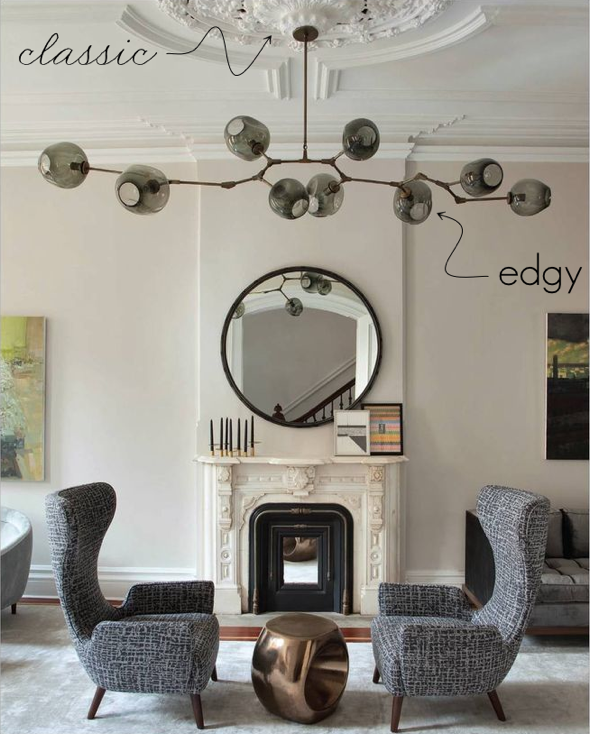 And if you love the Lindsay Adelman chandelier in the photo as much as we do (and we really do), get your own piece of her work here.